Do you have that one bad habit that you always find it hard to break? Worry no more, here I am with a list of 6 best apps to quit your bad habits. Get to know these apps and quit your bad habits right away. Who doesn't have a bad habit in their life? From smoking to even eating junk foods, we all are stuck with our own sort of bad habits. For some, it might not have much of a negative effect on their life, but for a vast majority of people, bad habits usually drag them away from achieving their dreams. So is it possible to break that one little bad habit that's driving you nuts? Of course, it's possible! But you just need to put on some effort and be consistent. Also, motivation plays an important role in keeping your consistency. Here I will introduce some of the best apps that can help you in sticking with your plan of breaking your bad habit. So without any further due let's get on with the 6 best apps to break your bad habits. The first one on the list is the HabitHub. It is a platform for everyone who is suffering hard to break a bad habit or to stick with a good one. As it's mentioned, this app works on the basis of Seinfeld's productivity secret, which is 'Don't break the chain!'. That is, habits are like a chain and every time you do a habit the chain grows. As you do them more and more, the chain keeps becoming longer and longer and eventually you will build a very long chain. Now if you wonder, how this theory can help you break one of your bad habits. Say your bad habit is smoking and you badly want to quit it. Now your aim is to build a chain of non-smoking days and keep it growing longer and longer. Each day you never smoke will count as a chain and eventually you'll quit smoking. Yet another great app on this list is the HabitBull. This cool productivity tool by App Holdings is a great way for you to either break a bad habit or build a good habit or both. The working principle of this app is similar to that of the HabitHub, where you're building a chain by daily doing a habit or not doing a bad habit. With countless motivational pictures and discussion forums, this app helps you to stick with your plan of breaking the bad habit. Moreover, you can keep track of all your habits in one go. It makes it simpler to organize your complete life. As you smash through your goals you can mark those successful days which help in building a success chain. Add reminders or notes to actually keep going with you said goal. The different in-app features and the simple interface makes this app a must-have for those who're trying to eliminate bad habits from their life and replacing it with a good one. 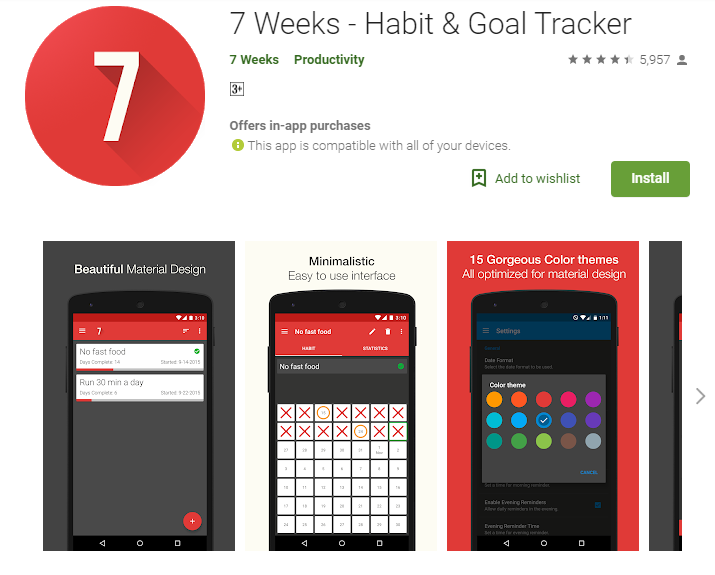 Create a goal that can either be building a new habit or breaking an age-old bad habit, 7 weeks is the perfect app for them. Here you will get an ultra-simple strategy to stick with your plan which is based on the "Power of Habits"- Charles Duhigg's bestselling book. With many gorgeous themes and customizations, this app provides a great interface to explore around. 7 weeks or 49 days, this is all you need to break a habit or build one and this app just performs as it promises. Want to change your habits or track your new goals or want to achieve some of those resolutions that you promised yourself? This app does these things perfectly which has been inspired by Jerry Seinfeld's Productivity Secret. Here the aim is to achieve a chain of developing a habit each day or staying away from those bad habits. Once you get not to break the chain and create a very long chain, that's when you build yourself a good habit or break that bad habit from your life. The most mentionable feature of this app apart from it being free is that it is also free from all sort of annoying ads. Moreover, scheduling your calendar, weekly progress, exporting to cloud or Google Play backups are some of the best features that this app offers. Just like the above-mentioned apps, here is yet another great habit changer app from PANAGOLA. Habit Calendar also delivers many of the above-mentioned features that you would love to see on a break bad habits app like scheduling your daily calendar, tracking your goals, marking the successful days, weekly progress and even uploading your data for future use. 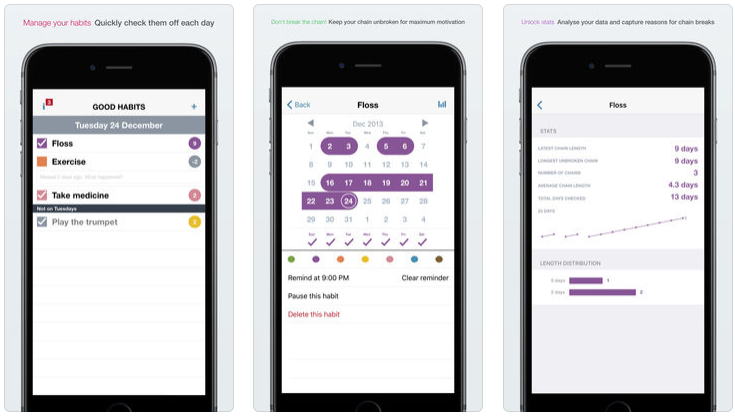 In addition to these features, the app also lets users create monthly reports, task totals table, adding reminders, notes and more. The clean and easy to use interface will definitely help you opt for this particular app. So the final one on the list of best bad habit breaker apps is the Good Habits by Good To Hear. The great feature that strikes me about this app is that you can achieve any of your goals whether it is buying a candy or reaching the moon with the help of this app. The secret of achieving such an impossible goal is by doing a little each day. You can also create multiple chain habits, track all your habits in one go and create reminders to never forget what you are up to. So there you are! You have been provided with a list of best habit changer apps for your smartphone. Now your only job is to find the perfect one that suits all your need and stick with it. Always remember that the hard of building a habit is keeping the consistency. Even if you're spending one minute a day for developing a particular habit, just promise to keep it consistent throughout your life. As my experience taught me, I would strongly recommend you not to start multiple habits simultaneously. Just choose one single habit and increase your pace very smoothly. I wish you all the luck in breaking your bad habits and developing a good habit.